After seeing an article I posted on my other blog yesterday called “When God Gives You More than You Can Handle,” a reader from Holland sent me the following message this morning: Do you have more suggestions on true missionary stories for me to read? I think that’s a great question, so I decided to answer it here. 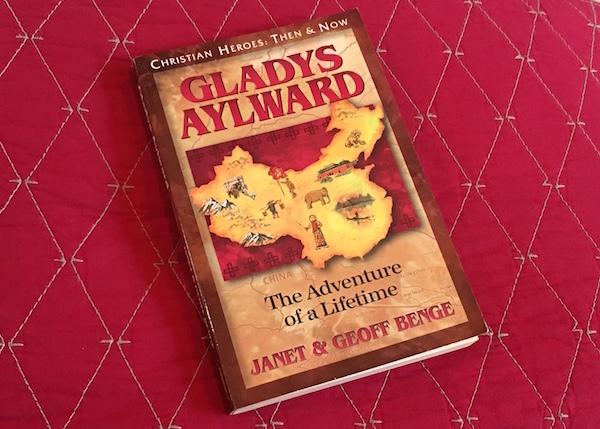 The book I mentioned in the post was Gladys Aylward: The Adventure of a Lifetime. It was written by Janet and Geoff Benge. We’ve read several more of their missionary biographies over the years, including the stories of George Müller, William Carey, and Amy Carmichael, to name just a few. We liked those so much that Doug bought an entire set of the Benges’ biographies at a homeschool convention a couple of years ago. We are now working our way through all of them. Not all of the Benges’ subjects are missionaries (in a traditional sense), but many of them are. The books are easy reads, but are still very informative — and inspiring! That’s all I can think of off the top of my head, but these recommendations should be plenty to get you started. Readers? Have I left off some of your favorites? If so, chime in with the titles of any missionary biographies you think belong on a must-read list. Any of the YWAM (Youth With A Mission) missionary stories are well worth the money put in. We are slowly acquiring them for our family. Currently we are at about 25. They also make great presents to give to other families. If audio adventures are more your type (road trips! ), the Brinkman Family CD’s are wonderful. These are made by a homeschooling family that take real missionary stories and weave their family into the adventure. On their website they have facts about the “real” missionary, bloopers as they make the CD’s, and many other good things all centered around missions. Mark and Hilda Buntain, Calcutta India? They gave their lives serving the orphans and street children of Calcutta, orphanage, feeding programs, shelters, schools, etc.